Check out the fantastic book we got in the mail. It's a board book--so a bit young for my kiddos--but Nathan and Rebekah sat down and read it with me anyway. Nathan was funny, he told me, "Isn't it great that I have autism? It let's me pretend to be enough of a baby to read this book with you." Haha...I'm not sure that's autism...I'm thinking it's just the ability to be childlike. Its a really darling and engaging book. It gives the basic idea of what is expected when you go to church (with your behavior) and what you can expect as a child attending church. It's very non-denominational and fits almost all churches I've ever been to. There might be some differences, between churches, but this is written very generically to cover most situations. The publisher has also provided a list of the Top Ten Tips for Introducing Your Child to Worship. I've linked the entire article because it gives details for each of the points. 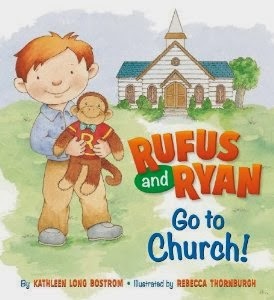 Rufus and Ryan Go To Church!In Rufus and Ryan Go to Church!, four-year-old Ryan explains to his stuffed monkey, Rufus, what is happening as they attend church on Sunday morning. He lets Rufus know when it's time to sing and to pray and to be quiet. Author Kathleen Bostrom brings a delightfully light touch to the text as she provides an introduction to an experience that most children are exposed to long before they understand why. And children everywhere will relate to the idea of explaining their surroundings to their favorite companions as they go about their daily activities. About the Rufus and RyanRufus and Ryan is a new series of books for preschoolers, featuring Ryan, an energetic little boy, and his stuffed monkey Rufus. Basic Christian and church concepts serve as the foundation of the series, with an additional focus on character traits and development. The text is presented in young Ryan's voice as he teaches Rufus about the concepts he is learning himself. Each story is about 150 words, using age-appropriate vocabulary and themes. About the AuthorKathleen Long Bostrom is a published children's author in both the Christian and trade markets. She has a Master's in Christian Education and a Doctorate of Ministry in Preaching, and she has worked in children's ministry for many years. Kathy and her husband, Greg, have three grown children and live in Illinois. About the Illustrator Rebecca Thornburgh began illustrating children's books full-time in 1996 and today has almost 100 books to her name. Rebecca's vibrant watercolors have been showcased in previous Ideals titles, including the new edition of The Story of Christmas. She lives in Philadelphia with her husband and two daughters. The publicist has agreed to give away one copy of Rufus and Ryan Go to Church to one of Coolestmommy's readers. Disclaimer: I was provided a copy of this book in exchange for my honest review.